Bharatpur is located 181 km to the east of Jaipur and it is most famous for being one of the world's most important bird sanctuaries.It was founded by Maharaja Suraj Mal in 1733. 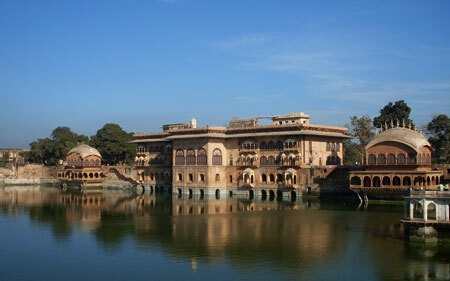 Bharatpur was once an impregnable, well-fortified city, and the capital of a kingdom ruled by Jat maharajas. The trip of Bharatpur, Deeg and Dholpur has played an important part in the Jat history of Rajasthan. The city and the fort of Bharatpur have been believed to be founded by Lord Aditya a Consultant in the early 17th century, the majesty established a state in the Mewat region south of Delhi, with its capital at Deeg. Leaders like Gokula, Raja Ram, Churaman and Badan Singhbrought the Jars together and moulded them into a force to be reckoned with Bharatpur and its Keoladeo Ghana National Park was developed by the rulers of Bharatpur by diverting water in the mid 18th Century to create a private duck resort. British Viceroys and other royal guests were entertained here with organised hunting parties.Today the park spreads over 29 sq. km of wetlands attracting a wide variety of migrant and water birds. There are 375 species of bird belonging to 56 families of Egret, Darter, Cormorant, Heron, and stork. Other birds include the Peregrine, Falcon, Steppe Eagle, Garganey, Teal, Snake bird and White Ibis. The Time to visit here is re are a large variety of stork including the Black Necked Stork considered to be the world's largest Stork.